Smooth, soulful, and a sound created entirely in the Virgin Islands. “Well Nathan and I started the band together, how many years ago, 2012? As a duo and then it grew from there,” Lourdes Aguila, lead singer and guitarist in the band Lourdes and the Switch. Lourdes, the namesake of the band, started playing with her husband Nathan. Then expanded the sound to include, what has now become the “switch.” They play everything from classic hits. 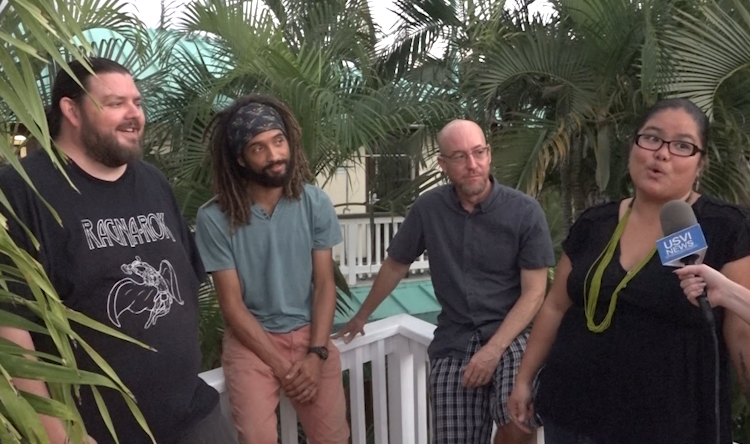 To now, their own original sound, as they prepare to release their first made in the VI album. Even though they’re all from all over the world, from the Philippines, to Ireland to Baltimore, they came together here in the USVI and made this home. They hope that eclectic sound comes across in their new work. “Bringing all those that culmination of musical backgrounds together we kind of found our own sound. And in this new album which Lourdes has is “Inside looking in” and that’s the CD release party that we’re kind of promoting for next Friday Dec. 7thit’s going to be at Chicken and Bowling down in Havensite so please do come!” Nathan McGlone, the bass player said. Just spend a few minutes with these guys and you can instantly feel their cool energy and easy-going vibe. They mesh together to perfectly make their individual sounds come to life. “As a musician sometimes, you can be snobby sometimes in terms of the music you play but then when you hang out with an awesome bunch of people and connect with people in the audience the genre is meaningless and the experience is the whole thing,” lead guitarist John Hairston added. “It is an eclectic mix of what we all bring to the table I guess but it is an honest mix that we all agree upon when we play together and it has formed itself in the past few years it’s been a great experience,” Ryan Diehl on the drums added. So if you want to hear that soulful groovy sound, just head out in the VI to your favorite food spots, you’re bound to catch a glimpse of Lourdes and the Switch. If you want to check out the band, you can catch them this Friday December 7th at Chicken and Bowling in St. Thomas for their album release party.